As parents, we know how hard it is to keep healthy lunches interesting for kids. And, let’s be honest, for ourselves, too! When packing lunches for camp days or outings to the park, it is so easy to grab high-carb snacks and processed foods. But reducing these options in our diets and making healthy choices is important for the whole family. I find that lunch, in particular, is an important meal for maximizing nutritional intake at our house. Breakfasts? They tend to be carb-heavy. My kids will eat a few bites of eggs, but are more interested in toast. Cereals are a staple in our house, as are Daddy’s pancakes. Dinners? My kids are more likely to be tired and picky at the end of the day. The best-laid dinner plans don’t always turn into full balanced meals for my children. Lunches? These tend to naturally be filled with more kid-friendly options. I make it a mission to get as many fruits and veggies into my kids during midday meals. So, lunch is essential for packing in the nutrition! Here are 5 healthy ideas to add to your lunch arsenal that only take a few minutes to prepare. My kids love them. Try them and see if they will be a hit with your family, too! 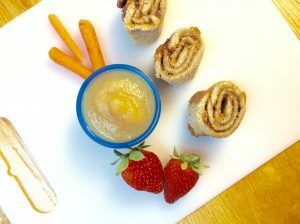 Tired of feeding your kids all those sugary popsicles on hot summer days? After a balanced lunch, try these healthy fruit skewers for dessert instead. Takes about a minute per skewer plus freezing time. – Wash fruit and select good, firm pieces. Allow to dry briefly or roll gently on a paper towel. You do not want too much excess liquid on the fruit. – Feed about 10-12 fruit pieces onto a skewer (if you use bamboo skewers, watch for splinters). Make interesting patterns with the fruit. – Line a cookie sheet with wax paper. 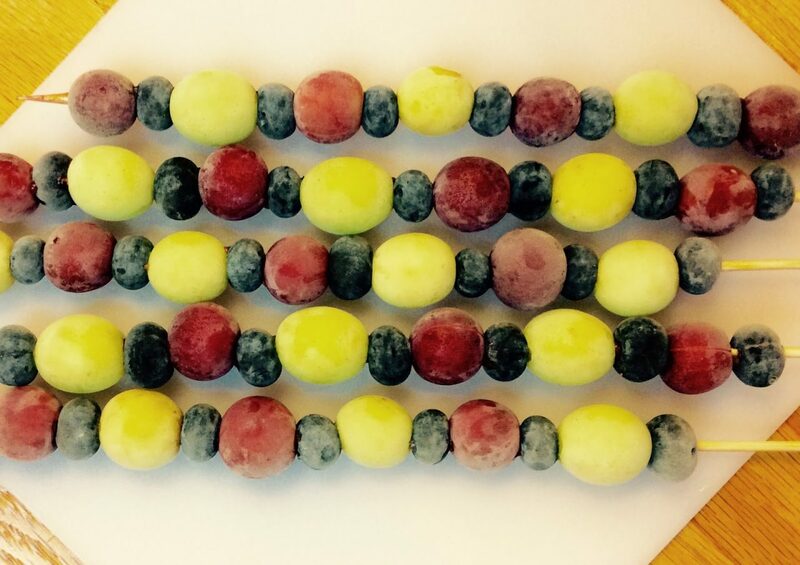 Place fruit skewers on your lined sheet and freeze for at least one hour. A sweet way to get a serving of vegetables on your kids’ plates. – In a medium saucepan, bring carrot juice and ginger just to a boil. Simmer for 3 minutes and turn off the heat. – In a medium bowl, whisk water and gelatin until quite thick. – Using a sieve, pour carrot juice into gelatin removing excess ginger particles. – Stir until smooth. Add honey to your desired level of sweetness. 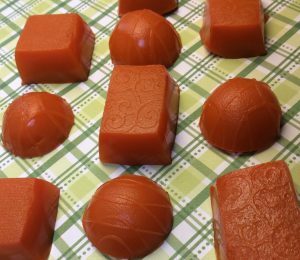 – Spoon into silicone candy molds and refrigerate for at least one hour. Tired of plain old PB&J? Make a more interesting lunch plate with these sushi-inspired rolls. – Using a rolling pin, roll 2 slices of bread very thin. Spread each slice of bread with a thin layer of peanut butter. Add a small bit of jelly or honey, if desired. – Place the two slices of bread next to each other, slightly overlapped. Carefully roll both pieces into a small log. – Using a bread knife, slice a small bit off each end to even up the edges. Slice three “sushi rolls” from the remaining log. – Serve with healthy fruit or veggie sides. Traditional banana bread is usually so sweet that it should be considered more of a dessert than a bread. But, these little banana bites are a healthier option for using up old bananas. 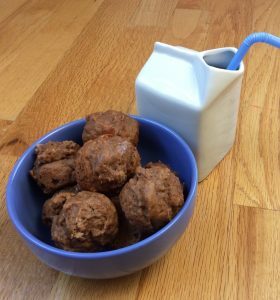 – In one bowl, whisk together flour, baking powder, salt, cocoa powder, and PB2. – In a separate bowl, mash bananas, then add, sugar, molasses, sour cream, oil, eggs, and vanilla. – Fold wet and dry ingredients together. – Spray a mini-muffin pan with baking spray. Fill muffin cups with 1 heaping Tbl. of batter. – Bake 10-12 minutes, or until toothpick when inserted comes out clean. 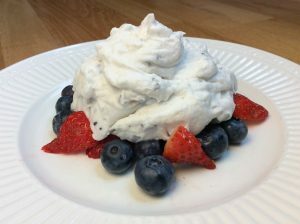 Healthy whipped cream for my berries? Yes, please! Chill the coconut milk 8 hours or overnight. Scoop the solid cream into your blender. Save the water for another recipe. Add blueberries, thickener, and optional sweetener to your blender. Blend until thick. Spoon over berries. Hope these snacks help to get your kids excited about eating healthy as well. Enjoy! Picniic is a family assistant that helps households become more organized, productive, and connected. Picniic brings all your family activities, tasks, and data together in one place. All family members can easily access Picniic via phone, tablet, and web to keep the household on the same page. Picniic has created a unique and easy-to-use product for managing and simplifying family life. For more information, please visit www.picniic.com.